`The patient suddenly resembled a writhing snake of great strength. . . More frightening than the writhing body, however, was the face. The eyes were hooded with lazy reptilian torpor. 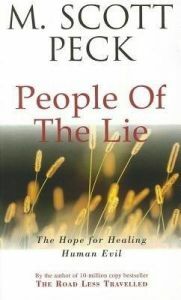 . . ` This is the second bestselling book by Dr M, Scott Peck. Here Dr Scott Peck describes his encounters during psychiatric therapy with patients who are not merely ill but manifestly evil - People of the Lie. This brilliant, disturbing book forces us to confront the darker side of our natures and to recogise that without spiritual (and indeed religious) dimension, modern psychiatry cannot claim to understand human nature or behaviour. It is a worthy successor to The Road Less Travelled. A graduate of both Harvard University and Case Western Reserve, Dr Peck served in the Army Medical Corps from 1963 to 1972 and had a private practice in psychiatry from 1972 to 1983. Since then, he has devoted much of his time and financial resources to the work of the Foundation for Community Encouragement, a nonprofit organization which he and his wife, Lily, helped found in 1984.